The Vito & Vito Show Blog: Fixing the 1st Amendment? Senate Democrats, led by Majority Leader Harry Reid of Nevada, are proposing to amend the Constitution. The idea is to fix the First Amendment. The argument is, money that influences elections should be regulated. Are public donations considered free speech? Democrats don't think so. Apparently, forty-six Senate Democrats believe the First Amendment is an impediment to re-elections. Senate Republicans passed the language to be debated on the floor with the excuse that Democrats are just wasting another week debating a bill that will surely fail. Corporations flood the political sphere with money every election. By limiting free speech, Democrats are actually making our speech more free. By limiting speech for corporations and billionaires allows unlimited speech for millions of average Americans. Politicians who are trying to limit free speech in politics are simply trying to protect their own seat in Congress. Also in the bill, Congress would have the power to ban books and videos that are political if they are funded by corporations. Where in the Constitution can Congress ban books and videos? That is specifically freedom of speech! In the history of the United States, nobody has ever amended the Bill of Rights, and now is not the time to start. A few weeks ago I wrote an article, "When Will People Defend the Constitution?" In that article I explained that people will only start to defend the Constitution once our rights are threatened or lost. Government infringing on our rights is what will make people finally realize what is happening, and that is exactly what is happening now in the Senate. Everybody says Congress can't do this, and legally they are correct, we are protected by our First Amendment right. But what if Congress ignores the Constitution (the President has before, why not Congress now?) and they do pass a new amendment to infringe on the First Amendment? The rights this nation is built on. The original reason for immigrants: our freedom. 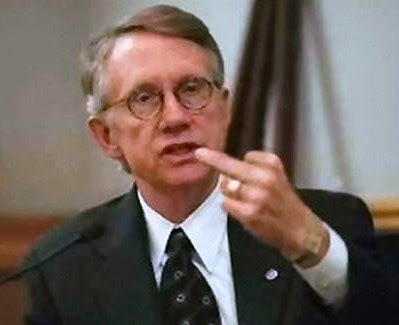 No words can describe how disgusting Harry Reid and the Democrats are. They make me sick. The audacity to challenge our rights. This means #WAAR!